If you’re like me and hopefully you’re not you can be hard on your vehicle. With the nicer weather showing up more and more we all want to make sure our vehicles are in good working order so we can go for that Sunday drive, staycation or anything else we have planned. Have you heard of WaterSavers®? It’s a consumer awareness campaign from the International Carwash Association® (ICA)h have tips to help you gear up for upcoming road trips and take care of any damage done by this year’s harsh winter. In fact here are four eco-friendly car tips to get you back on the road! 1. Wash your car at a professional car wash. WaterSavers professional car washes use an average of 40 gallons of water or less per car while recycling and filtering their water to prevent harmful chemicals from going into our rivers and streams. By comparison, the average home washing machine uses 41 gallons per cycle, and a garden hose uses 63 gallons of water in just five minutes. 2. Give the inside a deep clean. Apply some baking soda and a rubber sponge to your floor mats for an environmentally friendly and efficient clean. Then, wipe down interior surfaces with a microfiber cloth and vacuum the fabric and floor to remove dirt, sand, salt and dust. 3. Don’t forget the maintenance check. Winter is finally over, but that doesn’t mean your vehicle can skip an overall maintenance check, especially if you want to save energy. Make sure to have your oil changed and give your vehicle an once-over. Check the fluid levels as well. The more efficiently your vehicle runs, the more gas you’ll save. 4. How’s your tire pressure and alignment? Now, how about a giveaway?! Gap Stick – A versatile auto accessory to help access the hard-to-reach areas of a vehicle. 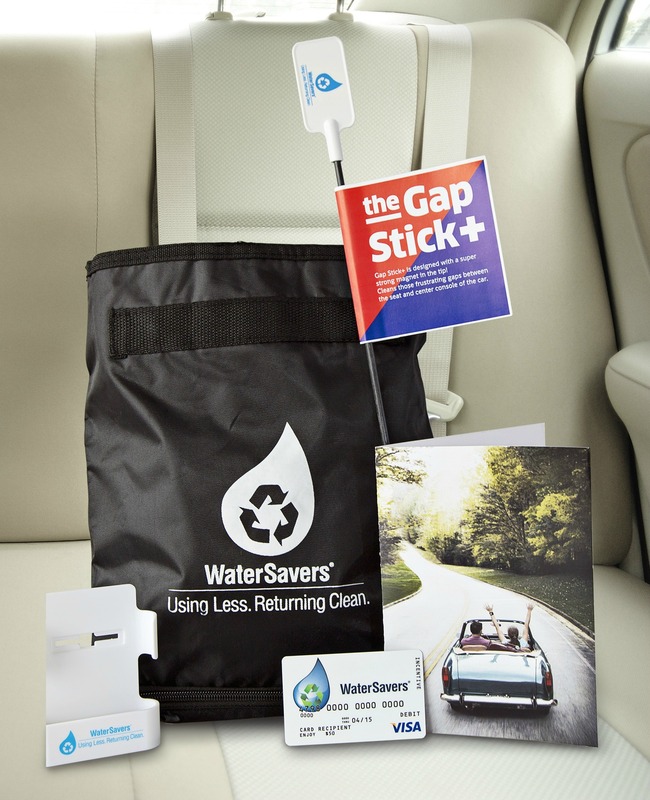 Designed with a strong magnetic hook, the gap stick can pick up a key ring, jewelry or anything else that has slipped between the seat and the center console. Phone Caddy – A plastic phone holder that clips to air vents in any vehicle to keep your phone in view for GPS usage and close to charging outlets. Auto Trash Bag – A sleekly designed bag with a bottom zippered compartment for extra garage bags or hand wipes. *Giveaway is open to US only. Giveaway ends 5/23/14 at 11:59pm EDT. My tip is to obey all traffic laws. It’s important to know the year your tires were purchased, and how long they have been on your vehicle. I learned a valuable lesson before it was too late – that even though my tires looked perfect on the outside, tread and all – they were almost nine years old, and put me at risk for blow outs due to interior bubbles, etc. The tire place even took one of my tires apart, and it had a weird looking bubble thing inside. So I was really glad to learn this fact. To help ensure your car will be around for a long time give it regular oil changes. I keep a bottle of hand sanitizer in each of the map pockets. It’s great for after I pump gas or while I’m just a little sticky. To check fluids regularly and keep up on routine maintenance on your car to keep it running well. Keep the windows up & use the AC because the car will use less gas. Read the manual to find out what maintenance needs to be done and when, then make sure it’s done. Hmmm. I don’t have any great car tips but have had a lot of tire issues lately because I didn’t pay attention to them needing replaced. So regular maintenance is so important! know your car. The way it moves and the noises it makes. Get your oil changed every 3,000 miles. I like to keep a little car trashcan for trash and keeping it clean. Always check your fluids, better to be safe than sorry. I always keep a summer emerg. kit and then one for the winter some of the winter essentials are cat litter for traction, heavy blanket. Some of the summer items are bottled water in case the car overheats or you do. Check your tire pressure! You get better gas mileage when at the proper pressure! Always, always, always keep up on your maintenance…hard lesson learned! I always keep wet wipes in my console and clean the inside of my car when i’m waiting for my daughter to come out of her school. I always keep a small trash bag in my car to make clean up easy. I also keep a quart of oil, rag, bottled water, icescraper and umbrella. You never know what could happen. I have several car tips including changing oil every 3000 miles, rotating tires, keeping all fluids filled, keeping car cleaned (engine and interior) and most importantly checking your car manual to follow all other recommended tips to do. Dont go below 1/4 tank, and always fill it up. Always keep an emergency kit in the trunk & keep up to date with all maintenance. Always check your fluids, tire pressure and have your car aligned. Love the vent clips for the fresh smell. What a cool giveaway! Tip – always keep wet wipes in the car for kid messes! The best tip I can give is don’t let your fliuds get too low, keep gas above 1/4 tank, use fuel cleaner every 3 months to keep fuel injector clean. Never allow your gas tank to get below 1/4 full because there is sediment in the bottom of the tank and you do not want this to get into the engine…it can and will cause major damage. Have you ever bought a used car and the seatbelts smelled of body odor? I have! Ewww! Use the same home remedy for Skunk bath to get the smell out. Sponge on seat belt, let dry, may need to vacuum off dry baking soda. Keeping the tank at least half full and the tires to the right level. I try to keep at least 1/4 tank of gas in my car. You never know what could happen. Perfect example was this past winter getting stuck in snow and having to keep the car running for some warmth. Some people were lucky and able to get help quickly. Others were not so lucky and ran out of gas before help arrived. Always carry a set of scredrivers and wrenches with you along with jumper cables and a first aid kit. keep a mylar blanket in your emergency kit! I keep a scissors in the glove box after watching a few videos about seatbelts getting stuck after a crash. And I have index cards on my kids car seats with their names and ages, in case something happens to me. Keep a grocery bag in floor for trash. Never ever let your gas tank go close to Empty very bad for the car and check the pressure of you tires also keep a good flashlight. Keep all the fluids topped off and add air to the tires once in awhile. MAKE SURE THERE’S ENOUGH AIR IN THE TIRES. Always keep an emergency kit in your car! You never know what might unfortunately happen and want to be prepared with medical supplies, non-perishable food and bottled water, blankets, flashlight and batteries, a map, flare signals, and whatever else you think you might need. Keep a bag for trash in your car!! So many people still throw trash out of their windows and it is just sad and completely unnecessary! Always check your oil and tire pressure before making long trips! My best car tip is to check the fluids and tire pressure every time you fill up. Always carry extra windshield washer fluid with you. Be sure to get to get your oil changed every 3000 miles. I like to keep all of those car wash and oil change coupons we get in the mail in an envelope in the glove compartment. Otherwise I never have them when I need them. Keep a blanket in trunk. Always make sure you keep up regular maintenance on your car and get a thorough check up before any road trips. Always make sure your tires are blown up to specification. It helps on gas mileage. When I was in high school, my dad and I drove around the Mojave desert and visited old mining ghost towns. At night we camped out in a tent. It was a great experience. My tip to myself is to always remember to plug in the car when I get home. (we have a Chevy Volt). My other tip would be to get your oil changed on a regular basis. Keep up on the car maintenance and you will have less problems down the road. Make sure your air pressure is at the correct amount in your tires. Don’t neglect your car’s oil changes. Always keep a “Readiness Kit” in your car at all times. Stuff like water, sweet items, blankets & various car supplies. I keep water and emergency supplies in the trunk. We also keep a tool kit and emergency medical etc. kit in the car. Some bottled water, roll of paper towels and a flashlight (with good batteries) in the glove compartment! Never let your gas level go below a quarter of a tank. Change your oil every 3-5000 miles! I’ve stuck to that with my current car, first time ever and it’s been a great car. Always make sure you have a good spare tire and some basic tools in the car. My main tip is keeping your oil changed. WASH AND POLISH YOUR CAR QUITE OFTEN TO KEEP THE PAINT JOB LOOKING GOOD–NOT DULL!! My best car tip is to have a husband that knows how to work on it. To extend the life and health of your car change your oil on schedule! Pack snacks and have small bags available for garbage. Makes it easier to clean the car after a long trip. Keep up with maintenance and keep extra supplies in the car. Lots of yummy snacks. Ones that are not eaten often. Should be fun and a surprise. Lots of books/games. And really good music!! Before going on a l road trip have the car checked out professionally. That way if potential car problems are looming, fix them and you probably won’t have a breakdown on the road. We just did this and had an oil change. The dealership also gave us free windshield wipers, too! Make sure you get a tune up yearly. If you get stuck in the snow or icy spot, use your car floor mat to help get a little traction. Place the mat behind or in front of the wheel that is spinning/stuck (depending on which direction you need to go). Make sure no one is around when you take off for safety issues. carry a fire extinguisher in your car. Make sure to keep a set of Jumper Cables and an equipped tool box, also a first aid kit. Always check tire pressure and be sure all 4 match for safety and smoother ride. My best car tip is to make sure you bring you car to a professional car wash. Most dealerships have the ones that wash the undercarriage of the car as well. This is important after a long winter to get all the salt off before it corrodes. This also saves on water and you get a really good washing. I always check my fluids and tire pressure especially if I am heading on a long trip. Always check your gauges before driving off. Best Car Tip? Buy a good used car with low mileage from an older person you personally know who has always kept their vehicle well maintained. That’s was one of the best things I ever did! Sure, maybe somewhat hard to find, but word-of-mouth did the trick! Check all fluid’s and tire pressure. Before we go on a long trip we have the car checked at a Auto place. My best car tip is to always have wet wipes and paper towels in the car! I’m not the best person with cars as far as knowledge goes, etc but one thing I am always consistent about is oil changes! Every 3k miles or 3 months. Always carry tools and a first aid kit! Keep a backpack filled with emergency supplies in your trunk! keep emergency supplies in the car at all times! Find a mechanic that you can trust and keep your tires in good condition. Make sure your car has the correct amount of coolant to protect it from overheating during the summer! Check you tire pressure often. change ur oil every 3000 miles! Check your fluids and tires at least once a week. Always have your tires and fluid checked before traveling long distances. Definitely,check your fluids,my son learned the hard way.forgot to check my oil and blew the motor in my navigator,soooooooo mad at him,but anyways thanks for the chance. I would love to win this,thanks for the chance.